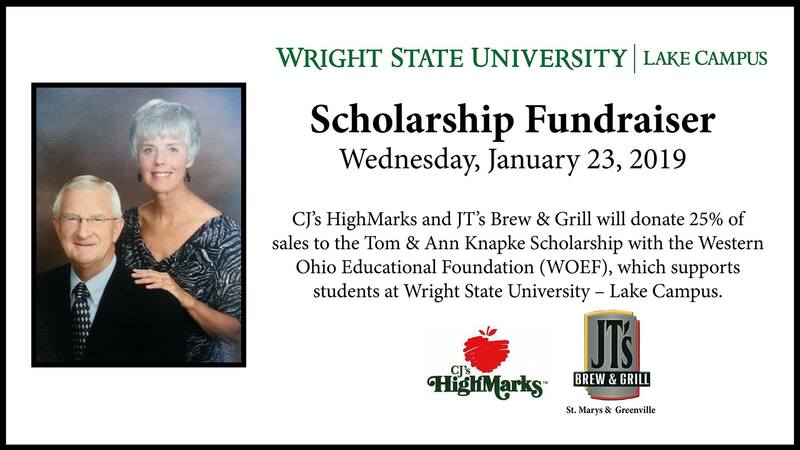 CJ’s HighMarks (Celina) and JT’s Brew & Grill (St. Marys and Greenville) will donate 25% of sales to the Tom & Ann Knapke Scholarship with the Western Ohio Educational Foundation (WOEF), which supports students at Wright State University – Lake Campus. Dr. Knapke was a former Dean of the Lake Campus, WOEF Board Member, Professor Emeritus, and member of the Grand Lake St. Marys Restoration Committee. He and his wife Ann were advocates for the arts, and teaching was very important to both of them. Ann passed away in 2013 and Tom unexpectedly in 2018. Their legacies will live on through their generous contributions to students attending Wright State University - Lake Campus.